The American politician and statesman William L. Marcy was born in Southbridge (then part of Sturbridge), Massachusetts, on the 12th of December 1786. He graduated at Brown University in 1808, studied law, was admitted to the bar in Troy, New York, and began practice there in 1810. During the War of 1812 he served first as a lieutenant and afterwards as a captain of volunteers, and on the 22nd of October 1812 took part in the storming of the British post at St. Regis, Canada. In 1816 he became recorder of Troy, but as he sided with the Anti-Clinton faction of the Democratic-Republican Party, known as the "Bucktails", he was removed from office in 1818 by his political opponents. As editor of the Troy Budget (daily) he was a vigorous supporter of Martin Van Buren, and when Van Buren's followers acquired control of the legislature in 1821 Marcy was made adjutant-general of the New York militia. From 1823 to 1829 Marcy was comptroller of the state, an office then especially important on account of the large expenditures for internal improvements, and during this period he became the leading member of the famous "Albany Regency", a group of able Democratic politicians who exerted a powerful influence throughout the state by their control of the party patronage and machinery. 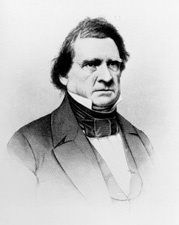 He was one of the associate justices of the New York Supreme Court from 1829 to 1831, presiding over the trial of the alleged murderers of William Morgan and in other important cases; and was a member of the United States Senate from December 1831 to July 1832, when he resigned to become governor of New York. In a speech in the Senate defending Van Buren against an attack by Henry Clay, Marcy made the unfortunate remark that "to the victors belong the spoils of the enemy", and thereby became widely known as a champion of the proscription of political opponents. He served as Governor of New York for six years (January 1, 1833 to December 31, 1838), but was defeated in 1838 by the Whig candidate, William Henry Seward. As Governor he checked the issue of bank charters by the legislature and secured the enactment, in 1838, of a general banking law, which abolished the monopoly features incident to the old banking system. In 1839-42 Marcy was a member of a commission appointed by President Van Buren, in accordance with the treaty of 1839 between the United States and Mexico to "examine and decide upon" certain claims of citizens of the United States against Mexico. In 1843 he presided over the Democratic state convention at Syracuse, and in 1844-45 he was recognized as one of the leaders of the "Hunkers", or regular Democrats in New York, and an active opponent of the "Barnburners." He was Secretary of War under President James Knox Polk from 1845 to 1849, and as such discharged with ability the especially onerous duties incident to the conduct of the Mexican War; he became involved, however, in controversies with Generals Winfield Scott and Zachary Taylor, who accused him, it seems very unjustly, of seeking to embarrass their operations in the field because they were political opponents of the administration. In the Democratic convention at Baltimore in 1852, Marcy was a prominent candidate for the presidential nomination, and from 1853 to 1857 he was Secretary of State in the cabinet of President Franklin Pierce. Few cabinet officers in time of peace have had more engrossing duties. His circular of the 1st of June 1853 to American diplomatic agents abroad, recommending that, whenever practicable, they should "appear in the simple dress of an American citizen", created much discussion in Europe; in 1867 his recommendation was enacted into a law of Congress. One of the most important matters with which he was called upon to deal was the "Koszta Affair"; his "Hulsemann letter" (1853), is an important state paper, and the principles it enunciates have been approved by leading authorities on international law. In the same year he secured the negotiation of the Gadsden Treaty, by which the boundary dispute between Mexico and the United States was adjusted and a large area was added to the Federal domain; and in June 1854 he concluded with Lord Elgin, governor-general of Canada, acting for the British Government, a treaty designed to settle the fisheries question and providing for tariff reciprocity (as regards certain enumerated commodities) between Canada and the United States. In 1854 Marcy had to deal with the complications growing out of the bombardment of San Juan del Norte (Greytown), Nicaragua, by the United States sloop-of-war "Cyane" for insults offered the American minister by its inhabitants and for their refusal to make restitution for damages to American property. The expedition of William Walker to Nicaragua in 1855 further complicated the Central American question. The Crimean War, on account of the extensive recruiting there for by British consuls in several American cities, in violation of American neutrality, led to a diplomatic controversy with Great Britain, and in May 1856 the British minister, John F. T. Crampton (1805-1886), received his passports, and the credentials of the British consuls at New York, Philadelphia and Cincinnati were revoked. The incident created great excitement in England, but in 1857 the British government sent Sir Francis Napier to Washington to take Crampton's place. To the Declaration of Paris of 1856, prescribing certain rules of naval warfare, Marcy on behalf of his government refused to subscribe, because Great Britain had rejected his proposed amendment exempting from seizure in time of war all private property not contraband. The diplomatic relations of the United States and Spain furnished, perhaps, the most perplexing of Marcy's problems. Upon the seizure (on February 28, 1854) of the American vessel "Black Warrior", the confiscation of her cargo, and the fining of her captain by the Cuban authorities, on the ground that this vessel had violated the customs regulations of the port of Havana, slavery propagandists sought to force the administration into an attitude that would lead to war with Spain and make possible the seizure of Cuba; and it was largely due to Marcy's influence that war was averted, Spain restoring the confiscated cargo and remitting the captain's fine. The secretary, however, was not averse to increasing his popularity and his chances for the Presidency by obtaining Cuba in an honorable manner, and it was at his suggestion that James Buchanan, J. Y. Mason and Pierre Soul, the ministers respectively to Great Britain, France and Spain, met at Ostend and Aix-la-Chapelle in October 1854 to discuss the Cuban question. But the remarkable "Ostend Manifesto", the outcome of their conference, was quite unexpected, and Marcy promptly disavowed the document. Marcy died at Ballston Spa, New York, on the 4th of July 1857, a short time after the close of Pierce's administration. In domestic affairs Marcy was a shrewd, but honest partisan; in diplomacy he exhibited the qualities of a broadminded, patriotic statesman, endowed, however, with vigor, rather than brilliancy, of intellect.